The government estimates that counterfeiting costs the UK economy £1.3bn in lost revenue each year. But true extent of the black economy isn’t known. Enforcement agencies can only estimate the volumes of counterfeit goods that are not found. This is the story of how one UK technology company, TWI, have broken the mould, without touching the wrapping paper. Traditionally, the fight against counterfeit goods took place at our ports and on the high street. Police, customs and trading standards officers followed illegal counterfeit goods and pounced at pinch points. These included border crossings, wholesale marketing hubs, town markets, retail outlets and car parks. These days, although this strategy remains effective, it can't deliver a robust defence against counterfeit fraud. The digital age has changed both the way we trade and what we trade. Chips present enforcement officers with a significant challenge. It’s impossible to check if smart goods contain fake micro-chips without ripping them to shreds. Even then a microchip is a specialised piece of equipment. It needs to be viewed under magnification. Checking for counterfeit chips is difficult. Computers and phones may contain counterfeit chips that have slipped into the production process. Hardwear must, as Intel’s famous old trade mark suggests, be authentic to the core. Consumers must know that the insides of their machines are as smart as their exteriors. The significance of the microchip fraud cannot be underestimated. An illegal global industry which begins with a scramble over the rubbish heaps of the world for recyclable chips, ends with serious malfunctions. UK based technology innovation company, TWI, say counterfeit microchips have been found in military jets and missile systems chip. The threat to all companies and organisations reliant on microchips for all of their functions is clear. These three words characterise the fight against counterfeiting. 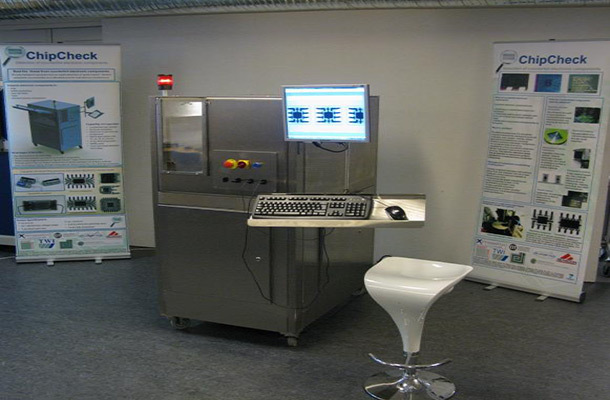 The Chip-Check system has been developed by an array of companies throughout Europe. In the UK, TWI, has created a prototype machine at its Technology Centre in Wales. TWI’s ‘chip check’ scanner tests the authenticity of microchips without opening the packaging. The device uses low energy X rays to visualise and compare microchips without causing damage to products or packaging. The ChipCheck machine addresses a serious problem and delivers a practical solution. High volumes of goods can be scanned and checked in a mechanised process. Having developed a working prototype, the ChipCheck project has now moved to Danish company InnospeXion. They will soon bring the finished product to market. It will help technology companies and enforcement authorities in the fight against inside jobs.